Much commenting, sharing, linking, and discussion then ensued. I received an email from a friend of mine who is a journalist (we’ll call her “Elle Bee” for now, as she prefers to remain anonymous), spurred on by that comment storm discussion. In it, she reminded me of something very important that is at the heart of the wine blogging community’s sense of… well… community, and that didn’t really get addressed in detail in my original post or the comments that followed. The important thing of which her email reminded me is that, individually, as wine bloggers, we have to represent. Like it or not, every one of us is, to the traditional journalist world, and to wine consumers at large who are not creating content about wine themselves, a representative of the entire wine blogging cadre. In other words, you (yes, you) for all intents and purposes are wine blogging. Don’t like it? Tough noogies. That’s the stage at which wine blogging finds itself. 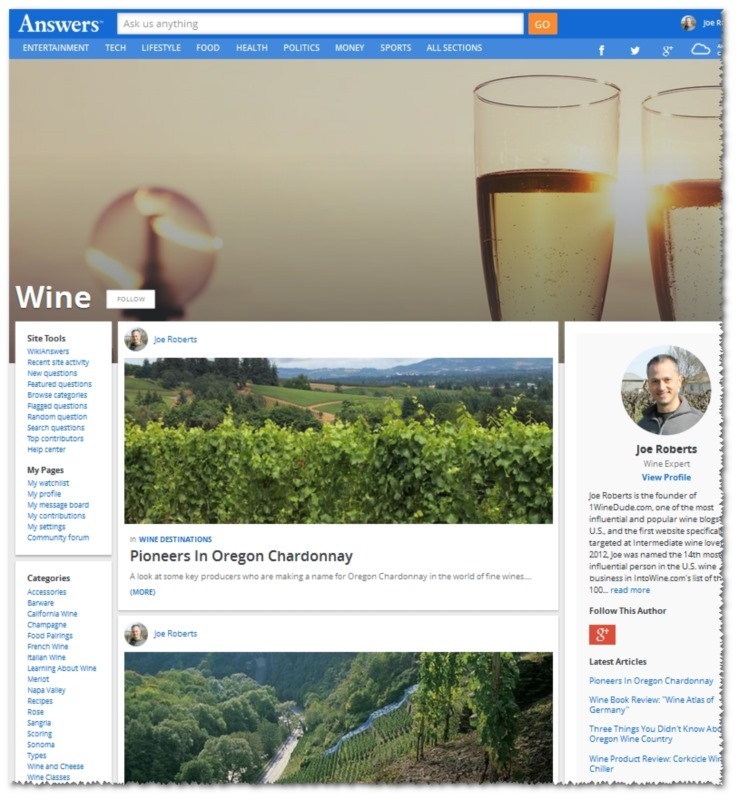 If you want something more for your wine blog, or from wine logging in general, and if you take the wine blogging community seriously and want to see it increase its reach and influence, then please carefully read Elle Bee’s commentary below. The first of two things I didn’t expect from Oregon, both of which were highlighted at Answers.com this month. Inspired by my recent jaunt to IPNC, and the media tour that preceded it, I decided that Oregon Chardonnay was impressive enough (to me, anyway) that it ought to get some luv, and shouldn’t be treated as the next-in-line white wine grape behind the state’s previous pushes of Pinot Gris (not bad) and Riesling (in some cases, quite good). The handful of producers in this roundup are making Chard that resonated with me for its hedonistic pleasure and its not-at-all-flabby acid action. All told, a nice surprise for me during my visit. What can I say, I dig wine trivia, okay? 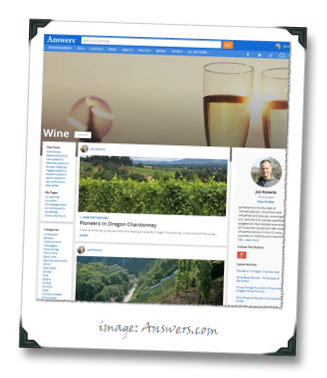 This collection of surprising facts about OR wine country is the latest in the series of articles highlighting some of a given wine region’s trivia. If recent history on the reaction to this series is any predictor, you will read it, then become geekily upset about the fact you didn’t know some of the details, and then finally privately e-mail or DM me complaining that either the stuff was too obscure, or that everybody already knows it. Whatever. Really… I just… didn’t get it. Apparently the Corkcicle is a brisk (ha-ha!) seller for some outlets. God bless ‘em, but I couldn’t get behind this sort-of wine chiller that requires some of the wine to be displaced first, sits in near constant contact with the juice I’d be drinking, and looks like a prop from the Harry Potter movies. Now this I totally did get, though I am not sure a book dedicated to the wine geography of Germany is totally necessary in a world where The World Atlas of Wine already exists, and has been recently updated in such fine form. Having said that, the quality rankings of the various vineyards makes for delectably geeky reading for those who are in love with German wine in general (guilty!). Generally speaking, when you’re attending a Pinot Noir masterclass-style tasting hosted by one of a wine region’s most historically significant properties, it’s not considered good form to giggle like an eight year-old girl. Which, of course, didn’t stop me from doing it. 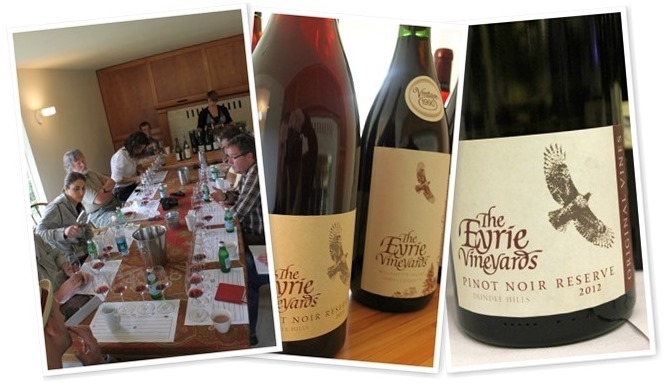 Here’s the thing: when you’re tasting through a retrospective of the Pinots representing those produced by our host – The Eyrie Vineyard’s Original Vines Reserve Pinot Noir – in a masterclass session that’s supposed to highlight vintage variation, it’s just freakin’ funny. 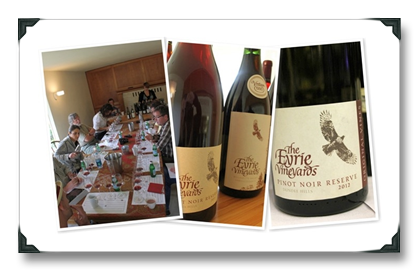 Not that there isn’t vintage variation – there is, for sure, vintage variation in Eyrie’s Pinot. It’s just that when the style is (thankfully) one of the entire wine world’s most consistent, the irony of trying to highlight that variation is… well, it’s freakin’ funny. So, I was giggling. Don’t judge me (I know, it’s probably already too late; fine, whatever).